 Cecilia Fox | Weekly Record Herald Mast. Sgt. Angela Potchik and her son Senior Airman Jacob Burritt placed a wreath a the veterans memorial in Tipp City on Friday, Nov. 9. Cecilia Fox | Weekly Record Herald Veterans Day essay contest winner, L.T. Ball student Alayna Moore, wrote about her dad, Steven Moore, and his service in the Navy reserves. TIPP CITY — On the cold, grey morning of Nov. 9, Tipp City fourth and fifth graders participated in a program thanking veterans for their service. 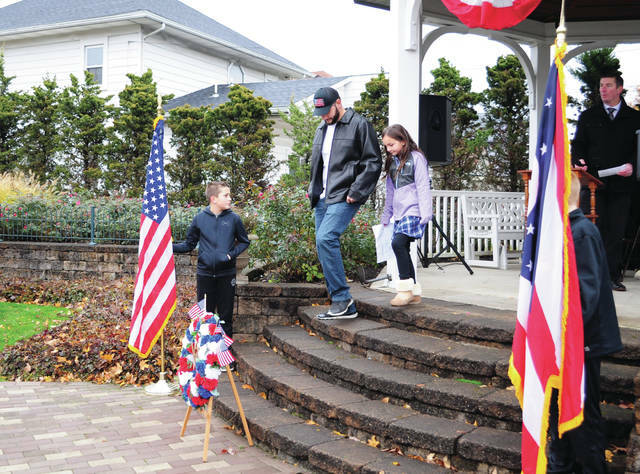 During the annual Veterans Day program in Tipp City’s Veterans Memorial Park, students sang patriotic songs and heard remarks from Navy veteran and commander of Dayton Post of the Ohio State Highway Patrol Sgt. Jeff Kramer. The winners of an essay contest sponsored by the Tippecanoe Masonic Lodge read their pieces, which were about the veterans in their lives. Alayna Moore read from her first place essay about her dad, Steven Moore, who served overseas in Iraq and Afghanistan with the Navy reserves. She recalled writing letters to her dad and video calls with him while he was in Afghanistan, saying “I missed my dad during these times especially, but my family would reassure me that he would return back home.” She also recalled meeting her dad at the airport with specially decorated signs welcoming him home. Fellow L.T. Ball student Preston Harding also read from his second place essay about his Uncle Russ, who served in the U.S. Marine Corps. “He served our country for 20 years and dedicated a lot of his life to the United States Marine Corps. Not many people can say they’ve done what he has for our country,” he said. Kramer spoke to students, encouraging them to be participants in their community and to be thankful for veterans and their sacrifices. Following the ceremony in the park, students invited veterans and active military to join them for lunch at the school. https://www.weeklyrecordherald.com/wp-content/uploads/sites/51/2018/11/web1_DSC_0073-1.jpgCecilia Fox | Weekly Record Herald Mast. Sgt. 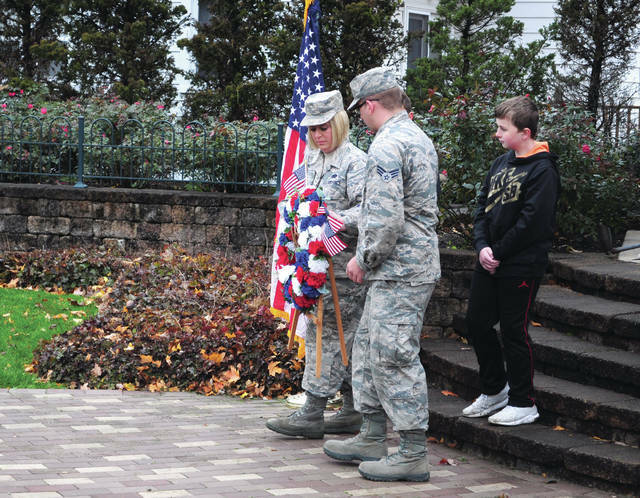 Angela Potchik and her son Senior Airman Jacob Burritt placed a wreath a the veterans memorial in Tipp City on Friday, Nov. 9.
https://www.weeklyrecordherald.com/wp-content/uploads/sites/51/2018/11/web1_DSC_0038.jpgCecilia Fox | Weekly Record Herald Veterans Day essay contest winner, L.T. Ball student Alayna Moore, wrote about her dad, Steven Moore, and his service in the Navy reserves.